Nicole Lyons is a force of nature disguised as a writer, a social activist, a voice for the downtrodden, and a powerful poet with a delicate touch. She is a consulting editor at Sudden Denouement Literary Collective. Her essays, poetry, and prose have been featured on numerous literary collectives and online magazines. Nicole was inducted into The Mental Health Writer's Guild in 2015 for her work on The Lithium Chronicles, Psych Central, The Mighty, and the International Bipolar Foundation. Nicole volunteers with a Canadian nonprofit that is dedicated to changing the way people talk about and and view mental illness. 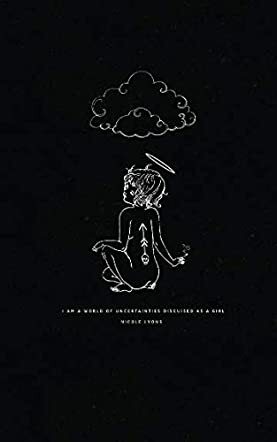 I Am A World Of Uncertainties Disguised As A Girl is an incredible embodiment of emotion, expressed through prose and poetry, and written by Nicole Lyons. The shuddering impact each verse creates in the soul of the reader is profound, dealing in various embattled reactions to situations in life and its complexities. Whether the subject be conveying one’s faith, promiscuity, temptations in life or broken hearts, each verse shakes you emotionally, as it reaches inside and tinkers with the many different experiences and aspects of a person’s existence. Never before have I read poetry on such a large scale of extreme raw emotion. I was able to feel and relate to the pain of Nicole Lyons as she expressed so many variances in her life, up to the point of waiting for the impact of death to take place. The violations of a human body and soul were also felt, bringing back some very painful moments in my own life, all of which were expressed so fully in the pages of I Am A World Of Uncertainties Disguised As A Girl. Whether Nicole draws each verse from experience or imagination, the talent which shines through each page is intense, almost to the point of it blinding the reader in a lyrical depiction of pain, heartache, disaster and emotional invasion. Two poems snagged my interest in particular: Turning Goodbye came across as a final message left on a tombstone or epitaph, whereas Impetus draws upon the raw emotion of a tidal pull. I wholeheartedly recommend I Am A World Of Uncertainties Disguised As A Girl to lovers of poetry over the age of 15 years, and look forward to adding it to my bookshelf at home, filled only with incredible works in literature. Readers will discern the cleverness of Freight Train, a dip into a suicidal mind, the analogy to a boat aground in Bursting Pure and Blooming, and the rightness of the title Three Sheets to Forever. Personally, I loved I Have Surrendered on this Night, the suspension of worries in dreams, and Yes, I Remembered You, unforgettable for this beautiful line: “a thousand wild stallions carried my pulse around the mountains of my bones”. My favourite of the short poems scattered throughout was Little Black Dress; fourteen words sum up all the doubt and longing to impress that ubiquitous garment implies. Nicole Lyons’ I Am A World Of Uncertainties Disguised As A Girl demands a place in the heart, and bookcase, of poetry lovers all over the world. Although, considering the perspective of her work, Nicole Lyons might smirk cynically at being called a major gifted talent, her collection of poetry, I Am A World Of Uncertainties Disguised As A Girl places her as such with no trace of uncertainty or equivocation. There is no doubt she earns such poetic respect for her peerless ability to communicate, clearly and precisely, the deepest sufferings of life, but also leaves no doubt she has endured them first. No one could talk like this purely by imagination. just itching to play chicken. In every poem included in I Am A World Of Uncertainties Disguised As A Girl, Nicole Lyons creates a beautiful continuity of rhythm, sound, meaning, and intensity. In turn, while accessible poetry is a true rarity, either sacrificing depth for shared understandings, or worse, using false obscurities to imply such depth, Lyons retains an almost suffocating emotional consciousness without sacrificing the familiar. And, perhaps most courageous for a poet seeking serious validation, she unerringly applies a ruthless conciseness to her creations that is apt to be mistaken for simplicity. Her poems are not simple. They are simply devastating. they rip me to shreds.